The latest Volkswagen Touran may not appear that different from its predecessor. But VW has taken a real step forward with this car. It’s roomier, more practical, better to drive and more economical than the previous model. In fact, the Touran is such a good people-carrier that What Car? named it ‘Best MPV’ at this year’s Car of the Year Awards. So, what are we looking for in this test? It's simple. 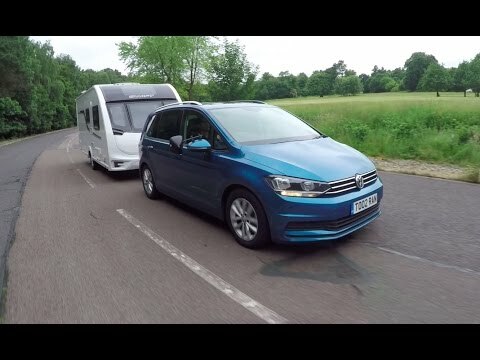 We know the Touran represents practical family transport – but what tow car ability does it have once hitched to a caravan? With a kerbweight of 1571kg, the VW Touran is relatively light for a car that has space for seven (cars with a manual ’box rather than the DSG automatic fitted to our car weigh 19kg less). That gives an 85% match figure of 1335kg, a modest number if you have a large family caravan to pull. However, the choice of suitable tourers is wider for an experienced tow car driver happy to pull up to 100% of the Touran’s kerbweight. We matched the VW to a Swift Challenger 510, with a Mass in Running Order of 1282kg. The Touran easily pulled the van up to the motorway limit, needing 12.1 seconds to tow from 30-60mph. On hilly roads the gearbox changed ratios smoothly, and was rarely caught in the wrong gear. With 251lb ft of torque from the 2.0-litre diesel engine, the VW Touran comfortably maintained speed uphill. However, in our hill-start test it took a restrained right foot to make sure that there was no wheelspin when pulling away. Otherwise, the VW handled this manoeuvre very well. If you have to stop in a hurry, the Touran’s brakes show real bite. They proved easy to apply smoothly in normal towing, but powerful enough to stop car and caravan in just 10 metres. Every time you hitch up you’ll appreciate the Touran’s high-speed stability, too – there was almost no movement from the caravan at 60mph. In a violent lane-change the Touran wasn’t quite so assured, with some shove from the tourer when really pushing on, although we never felt that the car was about to lose control. All told, this VW is a very capable tow car, albeit a relatively light one for a seven-seater. The VW Touran’s 16-inch alloy wheels don’t win points for style, but having taller tyres than most modern cars contributes to its comfortable ride. The suspension smoothes sharp road bumps well at low speeds, without feeling sloppy on country roads. There’s some lean if you tackle corners enthusiastically, but it’s well controlled. The 2.0-litre engine is familiar from many other Volkswagen Group cars, and it does a predictably good job in the Touran. There’s enough pulling power to cope with a fully loaded car, and once up to speed there’s little noise from under the bonnet. Road noise isn’t intrusive, which helps keep the Touran’s cabin quiet at speed. A Ford S-Max is more fun to drive, but the VW Touran is a very comfortable and refined car. Although it’s not as big as some rival MPVs, VW has made the most of the Touran’s 4.53m length. Up front the driver and passenger have plenty of room, and the standard of finish is very impressive. The interior perhaps lacks the flair of a Citroën Grand C4 Picasso, but the materials used are of a high quality. Although the sunroof eats into headroom slightly, legroom in the middle row is generous. The same can’t be said for seats six and seven but, because the middle row slides back and forth, it’s possible to free up more rear legroom if those in the middle row co-operate. There may not be much space in the third row, but the middle seats move right out of the way to make access easy, and the big glass roof area lets in plenty of light. With all seven seats up there’s little room for bags, but with the rear seats stowed the Touran is a very practical five-seater. Lower the middle row and the capacity is bigger than many estate cars. It’s a very good car, this VW Touran, but it should be at the price. In SE Family spec it costs £29,545: over £1000 more than a top-spec Vauxhall Zafira Tourer with considerably more power. What Car? predicts that the Touran will hang on to 39% of its original price after three years. That’s a relatively modest sum by Volkswagen standards, but a healthier return than you’d get from the equivalent Citroën or Vauxhall. On the plus side, the VW is well equipped, has a five-star safety rating from Euro NCAP and returned an exceptional 32.8mpg while towing. There are bigger, heavier MPVs than the VW Touran, but few are as comfortable, well-made and refined. It’s also a very good tow car, combining determined acceleration with high-speed stability.